Davlia is situated approximately 28km from Livadia, and is built onto a rock. The view from here is simply magnificent. 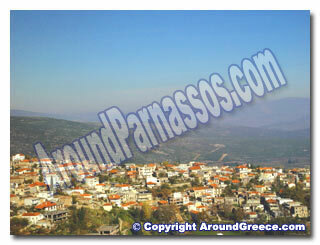 Davlia is a village situated on several levels on a slope on Parnassos, and is a lovely village for exploring. There are several cafe bars and place to eat. You will also find some bakers shops and also a mini market, where you can pick up some basic supplies. A little further our of the village, you can see the ruins of the ancient city of Davlias, which are still standing today. 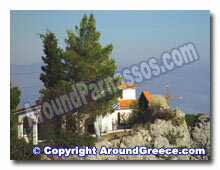 Well worth visiting is the Monastery of Kimiseos Tis Theotokou Jerousalem. This is found about 6km out of the village and is built on the slope of Mount Parnassos. The monastery is a very beautiful and peaceful one, and also has a camping facility located close by which is very popular and is always filled with caravans. 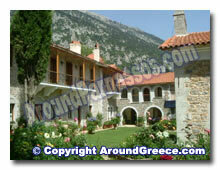 The monastery itself is a very pretty one with lots of colourful flowers amongst its green garden. The small chapel is beautifully decorated inside and is worth visiting to admire the icons and other religious artifacts found inside.